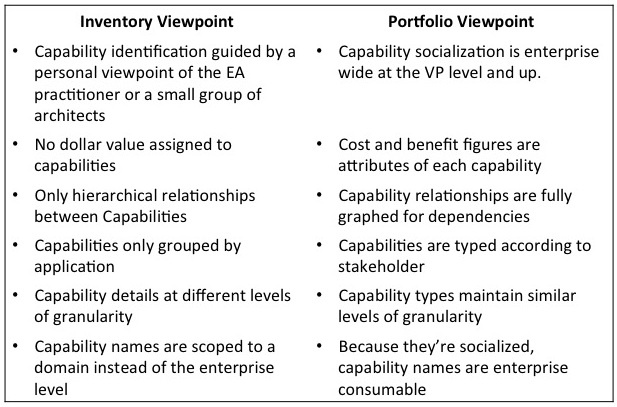 The Portfolio Viewpoint is a collection of well-defined capabilities and their relationships across a set of domains. The Portfolio Viewpoint supports executive level discussions and business strategy because it traces stakeholder (CEO, CIO, COO, CISO) vision to decision grade information for IT investment. But the Portfolio View usually doesn’t start out that way. As you can see the level of order is much higher and therefore of greater value in the Portfolio Viewpoint and while there are probably other attributes one can add to the mix the table above identifies some important ones. The danger with the Inventory Viewpoint is that if it is maintained in the same condition long term then it becomes an anti-pattern. Collecting capabilities without understanding the depth of their connections and the wealth of their meaning will end up as shelf-ware in a repository, however sophisticated that repository may feel. So resist the temptation to hoard capabilities. Don’t be afraid to talk to the business. And, above all, pay attention to what your stakeholders and their deputies tell you, particularly the office of the CEO, CIO, COO, and CISO.